Another deep winter week. The temperature will hover at -10C through the next few days, which is mild and good for walking if there is no wind, luckily the weather forecast does not show too much new snow. There is plenty now to say the least. Every single little horizontal surface, as small as it may be, is suffering and bending under heavy coating. When you look into the forest, there is so much of this white stuff that the atmosphere is almost suffocating. Moreover, it is only February, the heavy snowfall usually happens later in the spring. 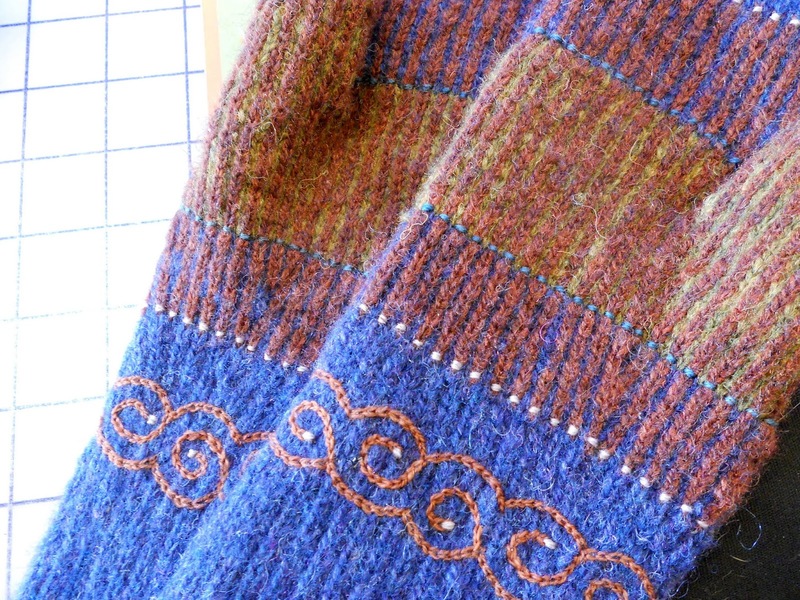 Since the last time we talked I made matching mittens for the hat which is still lacking lining - and no, I don't knit the lining, it has to be little more wind proof than the knitted fabric. Lining affects the drape of the hat and I find successful lining a bit tricky and that is the reason I am still wondering what to use for it. I love knitting mittens. 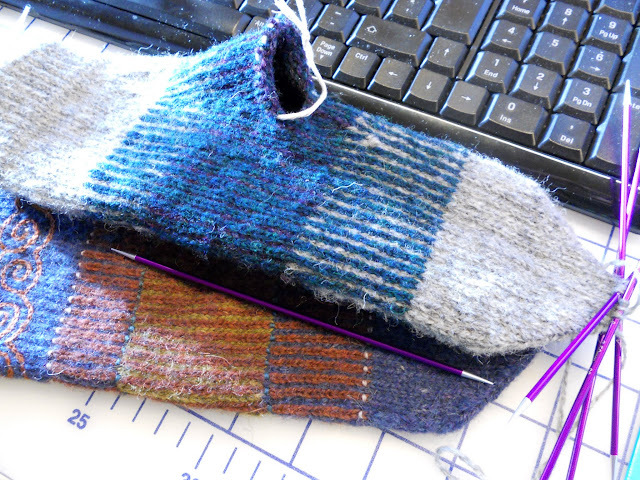 Strange but I don't often suffer from second mitten syndrome, when knitting socks I struggle. Knitting these was joy from the first stitch to the last. I used woolen spun Finnwool (2,5 mm needles) which is quite close to Shetland and great for color work. 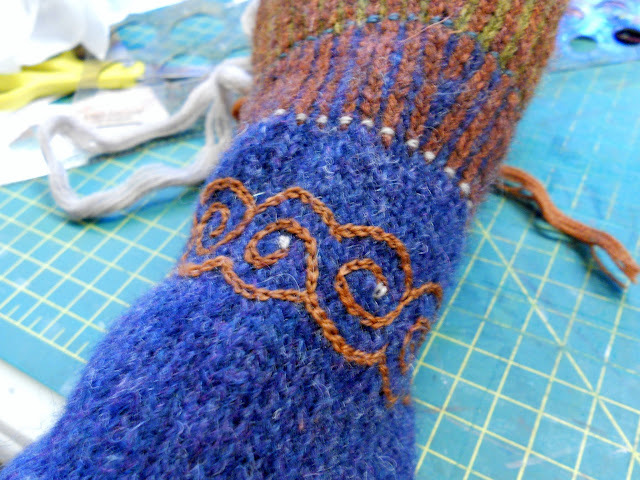 Before embroidering I blocked the mittens to even out the surface. Here you can see how crumpled the mitten looks before a good bath, you can hardly see the non-dominant color. 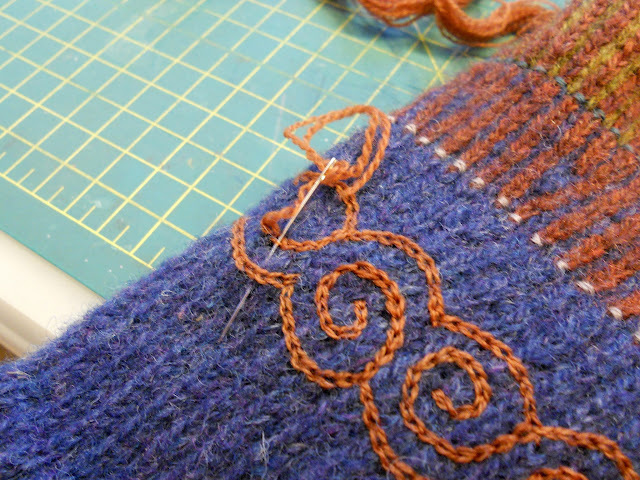 The knitted surface is soft and even after blocking a bit uneven (being handmade) and I think that it adds to the charm of the embroidery, it is never perfect, but little bit wonky, the way it should be I think. 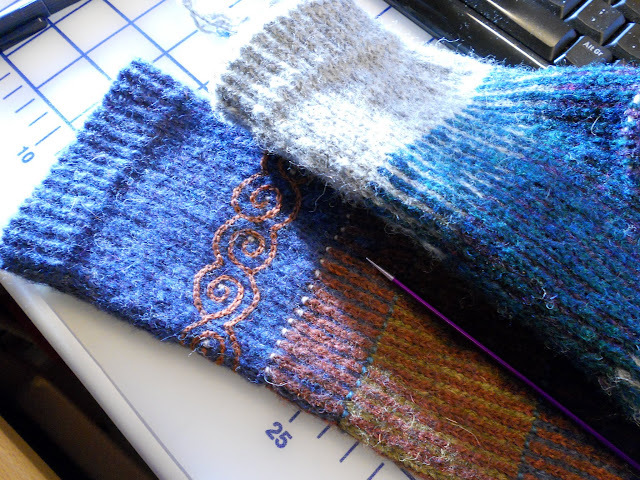 I cast on for another pair, I am making the cuff shorter this time, but there will be enough room for needle work. I like to make the thumb gussets long, I think it makes the knitted mitten a bit more graceful and sophisticated. The embroidery wool is the ever wonderful Renaissance Dyeing crewel wool. It is such a bliss to work with, I am amazed every time. The colors and the quality, could not be better, honestly. PS. The little quilts, I use Roxanne's basting glue first and then I will use chain stitch to anchor the applique. Exquisite work - love all the details and the combination of them. I'm sure our lovely mittens will warm your hands and bring a smile to your face. You take such care and have a real eye for color and design! Oh how beautiful! I have just the opposite problem - second socks fly off the needles, second mittens are a bit of a struggle! Your embroidery is such a perfect embellishment! I love these mittens. They're beautiful! I love your mittens, your knitting needles and your embroidery. Thanks forsharing with us. Eine wunderbare Arbeit. Großes Kompliment!! Lovely mittens! They look so warm. I cannot imagine how cold it must be there right now. What beautiful work -- as usual! I can't agree with your assertion that the embroidery is "...not perfect, but a little bit wonky". I think it is stunning. You have a way of distilling design elements to the simplest rendering in a way that is so beautiful. It is a gift to read your blog, to learn a little bit about your land, and to see what inspires you. Thank you for sharing. On another note, I also appreciate your winter landscape, as I grew up on the Canadian prairie. Also verry cold, but with more light. Beautiful mittens! Love everything about them. Finnwool is at the top of my favorite wools to spin. They're beautiful, and look wonderfully warm too! Lovely to hear from you again. The mittens are beautiful; you are such an inspiration! Your mittens are absolutely beautiful!